Learn how your business can win big in Vegas with Cornerstone's unified talent management. Meet us at HR Tech! Meet with a Cornerstone expert to see how you can recruit, train, and manage your people in one unified cloud platform. Plus, grab some swag and get a free professional headshot while you're at our booth! Party Like It's Your Job! RSVP for one of HR Tech's most legendary parties, hosted by Cornerstone and CIC Plus. Wed. Sept. 12 | 7:30 p.m.- 12 a.m. In this session, Coley O'Brien, Wendy's Chief People Officer, will share how they achieved higher sales, faster speed of service, improved customer satisfaction scores, and increased employee engagement and retention by creating a culture of learning. Hear from some of the HCM industry's most accomplished and influential product leaders as they shair their point of view on the future of the Human Capital technology landscape. The Fourth Industrial Revolution is ushering in cyber-physical systems involving entirely new capabilities for people and machines, and the next five years will be completely different from the last 20. This session will provide you with a 10-year forecast for what the future holds and the skills you’ll need to thrive in it. Visit our Booth (#1504) to Hit the Jackpot! 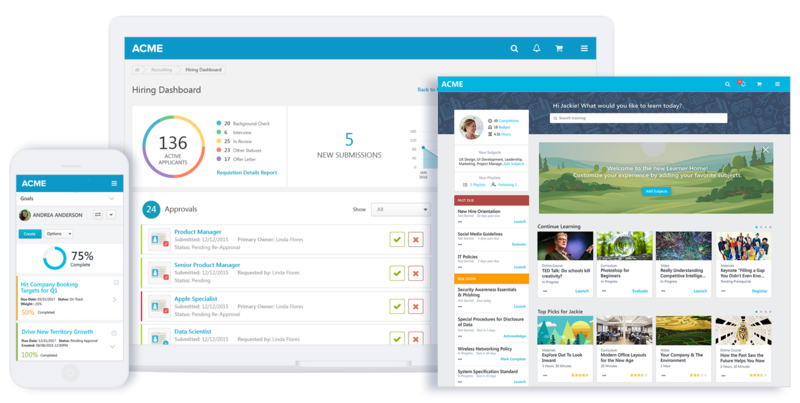 One unified cloud platform to recruit, train, and manage people. Recruiters are challenged with using legacy systems―or complicated solutions―for modern recruiting. Cornerstone Recruiting gives you the whole talent picture. Find the right talent with social tools, custom career sites, and a fun candidate experience. Get more than a standard learning management system (LMS). Cornerstone Learning goes beyond compliance - it’s self-guided, ongoing learning. Modern, tailored training boosts employee performance and supports organizational goals. Let managers inspire greatness, motivate employees, and deliver results. Cornerstone Performance provides goal & competency management, development plans, and reviews. Align employees with organizational strategy and provide meaningful feedback. LET'S TALK AT HR TECH! ©2019 Cornerstone OnDemand. All rights reserved.